Thanks to dedicated lawmakers, the people in Montgomery might soon have a good chance at fighting back against predatory payday and title lenders. However, they can’t do it alone. Constituent support is key, especially since payday and title lenders give thousands of dollars every year to lobby for less regulation. The more that citizens can voice their opinions, the more likely it is they’ll see real change. Montgomery, Alabama is famous for its mark in the Civil Rights movement. Montgomery was where Rosa Parks began her famous crusade against the segregated bus system that sparked the Montgomery Bus Boycott. Dr. Martin Luther King Jr. was a preacher in Montgomery during that time, which became the center of the march against racial inequality. The capital of Alabama, Montgomery is also known for its economic struggles. The city has a population of 205,7641 with a poverty rate of 24.1%2—almost 10 percent higher than the national poverty rate.3 While the unemployment in Montgomery is fairly low (3.4%),4 the job growth rate is -0.62%.5 A negative job growth rate means fewer jobs for qualified Montgomery residents, which could lead to a dependence on payday and title loans. 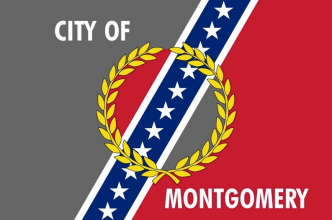 The total city debt is $456,923,8786 and the debt per capita is $2220.62.7 The living wage in Montgomery is $10.67 for 1 adult, $22.07 for 1 adult and 1 child, $27.86 for 1 adult and 2 children,7 but the minimum wage is only $7.25.9 Any time there’s a difference between the living wage and the actual wage, issues of crime, poverty and financial security are going to run rampant. Montgomery residents turn to payday and title loans because there likely aren’t enough jobs with decent salaries. When jobs are scarce and pay too little, people turn to short-term solutions like payday and title loans. Unless Montgomery increases its minimum wage and entices employers to create more jobs, people will fall victim to predatory lenders. A payday loan is a short-term loan, usually with a due date between 14 and 30 days. The borrower is given the loan in exchange for handing over direct access to their bank account, usually in the form of a post-dated check or their routing and account numbers. It’s called a “payday loan” because borrowers are expected to repay the bank during their next payday. That’s not what usually happens. Two weeks usually isn’t enough time for them to gather the funds to repay the loan. In most cases, borrowers are unable to repay the loan when it first comes due, so they have to refinance the loan, adding on more fees each time. The biggest problem is that payday loans have larger interest fees than other types of loans, such as credit cards, personal loans, etc. In Alabama, the payday fee per $100 is 17.50,9 but since the maximum allowable loan is $500, that amounts to $87.50. Plus, that fee is only good for the initial loan period. After the customer refinances, their fee is calculated again. In Alabama, the maximum APR is 456%10—much higher than any other form of credit. In the city of Montgomery, there are 747 licensed payday lenders in 2016—down from 1,100 in 2015.11 While this represents a significant decrease, that still means there are almost 750 lenders targeting poor and uneducated people who have no idea what they’re signing up for. Because so many people in Montgomery struggle with poverty, it’s no wonder why they turn to payday lenders to make ends meet. These lenders promise to be a bridge to financial prosperity, but instead, they trap borrowers in a seemingly endless debt cycle. The average Alabama payday loan principal is $326 with an average fee of $56.11 Roughly two thirds of customers refinance their payday loans,9 racking up more fees and interest. As a pastor, I have stood next to a man in tears as his car was towed away because he had gotten in over his head in escalating debt. Alabama pastor Dale Clem wrote an impassioned op-ed about the good work he had seen his father do as a bank branch manager. He helped people take out loans, offered them advice on budgeting and helped them manage their finances. Now as a servant of God, Clem sees the dark side of lending. “As a pastor, I have stood next to a man in tears as his car was towed away because he had gotten in over his head in escalating debt. With the repossession of his vehicle, he had no way to get to work. Parents have shared how they took out a payday loan to purchase medicine for their children and then got stuck in a cycle of debt much larger than the initial loan,” he wrote. He says the interest rates in Alabama are currently exploitative and prey on the weakest citizens. While the federal government and the CFPB are working on regulation to cap payday loan interest rates, he says it’s time for the state government to step in first. ● According to Diane Standaert, director of state policy at the Center for Responsible Lending,13 Alabama residents paid $116 million in payday lending fees. This is the part of the total $480 million in fees for both payday and title loans paid by Alabamians, the sixth-highest amount in the country. Because of how much people in Alabama spend on payday loans, it’s even more critical for agencies and legislators to regulate their use. Title loans are similar to payday loans, in that they both have quick due dates and charge high interest rates. However, title loans are often considered more dangerous than payday loans because the loan is given in exchange for keeping your car as collateral. When a customer signs on for a title loan, they agree that if they can’t make their payments, the lender can take possession of their vehicle. This is dangerous because for many people, because their car is their main way to get to work and likely their biggest asset. People turn to title loans if they need a lot of money. Since Alabama payday lenders are limited to $500 loans, people often use title loans if they need several thousand dollars. Title loans are a huge problem in Montgomery, as Alabama is number one in the country in title loans.15 Only 16 states allow title loans. Another major problem for residents in Alabama is that if a lender repossess your vehicle, they’re allowed to keep all the proceeds from the sale, even if it exceeds how much you owe them. This particular rule is incredibly lenient toward the lender and penalizes the borrower more than any other state. Alabama residents need to be particularly careful in how they use title loans, because they could lose more than they bargained for. If possible, they should take out a credit card or a personal loan or borrow the money from family or friends. Montgomery resident Harriet Cleveland was babysitting her grandchild when police came to her home to arrest her. Her crime? Not paying traffic tickets. The company created a payment plan for her and threatened her with jail time. Desperate to come up with the money, she took out a title loan. But then she lost her car as she was unable to keep up with those payments as well. Cleveland calls her situation a modern debtor’s prison, where people go to jail because they aren’t able to pay their debts. The secondary issue in this case is that she lost her car to a title loan because she was desperate to avoid being in jail. "[Payday lenders prey] on people who are very often less educated, less financially affluent,"
In 2017, state Rep. Bob Fincher sponsored a bill that would cap interest rates for payday loans at 36%. Where did Fincher come up with that number? He says 36% is the maximum amount of interest that military members are allowed to be charged. Right now, 15 states and Washington D.C. either have a 36% interest rate cap on payday lenders or have outlawed them entirely. “It preys on people who are very often less educated, less financially affluent,” Fincher said. Fincher’s bill would allow the public to vote on payday loan interest caps, which is a smart strategy. Any time in US history that the public has been able to vote on whether or not to cap interest rates for these types of loans, the measure has passed with a strong majority. The article goes on to say that a survey of Alabama residents said that 65% of them would support an interest rate limit. Fincher says this bill would prevent Alabama residents from being abused by payday lending companies, many of which are owned by out-of-state corporations. That means the fees they collect don’t even benefit the economy of Alabama. In 2016, a bill advocating for lower interest rates for payday or title loans was made it to the Alabama Senate or House of Representatives, when a bill from Sen. Arthur Orr, R-Decatur was discussed in the House Financial Services committee. The committee did not vote on the bill and it eventually died. While title and payday loans are still legal in Montgomery, lenders are still held to certain rules and regulations. Even though some of these stores may try to be transparent, many purposely subvert the rules. These lenders have to have a current license to operate within the state, and some forget to renew their license or never receive it in the first place. If you feel you have a legitimate objection against a lender, you can file a complaint with the State Banking Department at http://www.banking.alabama.gov. You will find the required form which you can email or mail to the following location. Remember to make copies of all your paperwork and keep the originals for yourself. The form will ask you to write down what you are complaining against, if you have notified any other agencies, if you have an attorney and what your ideal resolution would be. You’ll need to provide as much proof as possible to support your argument. Include the payday or title lender’s license number, which you can find through the Bureau of Loans. The site doesn’t say how long it will take for each case to be resolved, so check back every few weeks. Remember, these organizations are typically run by volunteers, so don’t be discouraged if it takes them a while to get to your case. Try to call once a week to check in and make sure your paperwork hasn’t been forgotten. In a city where job growth is nonexistent, where people don’t go to college and with a population that has been historically disenfranchised, it’s not a surprise why payday lenders thrive. An educated public is more likely to know what high interest rates mean and where to find a better deal. They’ll be more likely to have a higher credit score and to qualify for a loan with a better interest rate. That’s why lawmakers need to take charge and make predatory lending illegal in Alabama. Credit Counseling Agencies in Alabama: This is a comprehensive list of credit counseling agencies from the US Bankruptcy Administrator. These firms are licensed credit counselors, who can help you manage your debt and create a budget. They won’t necessarily offer you direct monetary assistance, but they can help you manage your debt so you aren’t tempted to take out a payday or title loan. Family Assistance: While this organization provides support for needy families, it’s only available to families with dependent children. Support includes temporary cash assistance, job training and more. They can help you get back on your feet and avoid using payday lenders. They can also help people apply for food stamps, child care and more. Regulating auto loans needs to be a primary concern for both residents and legislators who care about the financial well-being of their constituents. People who are financially healthy make better citizens, employees and residents and are more likely to contribute back to the Alabama economy. They should pressure their local representatives to pass a bill limiting payday and title loan interest rates to a reasonable 36 percent or less. You know payday and title loans in Montgomery are a problem. But what about other Alabama cities? Montgomery, Alabama. Wikipedia. Accessed January 8, 2018 from https://en.wikipedia.org/wiki/Montgomery,_Alabama. “QuickFacts: Montgomery City, Alabama.” United States Census Bureau. Accessed January 8, 2018 from https://www.census.gov/quickfacts/fact/table/montgomerycityalabama/AGE295216. “What is the current poverty rate in the United States?” Center for Poverty Research. University of California, Davis. Accessed January 8, 2018 from https://poverty.ucdavis.edu/faq/what-current-poverty-rate-united-states. “City of Montgomery, Alabama Comprehensive Annual Financial Report for the Fiscal Year Ended September 30, 2016” MontgomeryAL.gov. Accessed January 8, 2018 from http://www.montgomeryal.gov/home/showdocument?i=8706. “Living Wage Calculation for Montgomery, AL.” LivingWage.MIT.edu. Accessed January 8, 2018 from http://livingwage.mit.edu/metros/33860. Montgomery Alabama Residential Rent and Rental Statistics.” DeptofNumbers.com. Accessed January 8, 2018 from http://www.deptofnumbers.com/rent/alabama/montgomery/. “Payday Lending Stores in Alabama: Facts and Issues” LWVAL.org. Accessed January 8, 2018 from http://www.lwval.org/payday-lending/payday-lending-facts-&-issues.pdf. “Alabama’s toxic lending problem: Who cares?” AL.com. Accessed January 8, 2018 from http://www.al.com/opinion/index.ssf/2017/05/alabamas_toxic_lending_problem.html. “Alabamians used payday loans two million times in 2015.” AL.com. Accessed January 8, 2018 from http://www.al.com/news/index.ssf/2016/09/alabamians_use_payday_loans_tw.html. McAdory, Joe. “Auburn professors: Why can’t banks provide payday-style loans without payday-style rates?” OCM.Auburn.edu. Accessed January 8, 2018 from http://ocm.auburn.edu/newsroom/news_articles/2014/10/auburn-professors-why-cant-banks-provide-payday-style-loans-without-payday-style-rates.htm. Poe, Kelly. “Obama speaking on payday lending: what you need to know about payday lenders in Alabama.” AL.com. Accessed Jan 26, 2018 from http://www.al.com/business/index.ssf/2015/03/obama_speaking_on_payday_lendi.html. Izor, Chris. “VIEWPOINTS: Alabama leads nation in car-title loan outlets.” Blog.AL.com. Accessed Jan. 26, 2018 from http://blog.al.com/birmingham-news-commentary/2012/09/viewpoints_alabama_leads_natio.html. “SPLC client recounts devastating debtors’ prison experience to congressional staffers.” SPLCenter.org. Accessed January 8, 2018 from https://www.splcenter.org/news/2016/01/15/splc-client-recounts-devastating-debtors%E2%80%99-prison-experience-congressional-staffers. Bourke, Nick, et al. “Payday Lending in America: Who Borrows, Where They Borrow, and Why” PewTrusts.org. Accessed January 8, 2018 from http://www.pewtrusts.org/~/media/legacy/uploadedfiles/pcs_assets/2012/pewpaydaylendingreportpdf.pdf. “Montgomery Public Schools, Alabama.” Ballotpedia.org. Accessed January 8, 2018 from https://ballotpedia.org/Montgomery_Public_Schools,_Alabama. “2017 Alabama Regular Session – Final Report” AlabamaAppleseed.org. Accessed January 26, 2018 from http://www.alabamaappleseed.org/news/advocacy-news/2017-alabama-regular-session-final-report/.